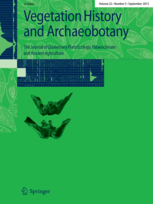 If you have exciting new research on past ecological change please consider submitting it to Vegetation History & Archaeobotany. what it was the ancient Maya feasted upon (Cagnato, 2017)! The paper by Arnoldussen & van der Linden (2017) presents archaeological and palaeoecological evidence from banks formed around so called “Celtic fields” (or Raarakker in Dutch) found at two locations in the Netherlands. Celtic fields are found across north-western Europe and are generally thought to have been created c. 3000-2000 years ago (Bronze Age and early Roman period). However, how the banks that characterize this ancient patchwork system of agriculture were formed remains a subject of scientific debate (e.g. Groenman-van Waateringe & van Geel, 2017). The evidence presented by Arnoudussen & van der Linden in this article comes from geochemistry, fossil pollen, fossil charcoal and archaeological artefacts. The authors interpret this evidence as suggesting that the banks developed gradually through a process of soil accumulation rather then due to the clearance of the ‘fields’ to assist in the agricultural process.Intriguingly, the suggestion of gradual accumulation by Arnoldussen & van der Linden could be seen as lending support to the recent hypothesis that it was the banks and not the depressions that were used for agriculture in ancient times (Groenman-van Waateringe & van Geel, 2017). The paper by Cagnato (2017) focuses on a “Chultun” (an underground pit dug by the ancient Maya) found at the La Corona archaeological site in Guatemala. Within the Chultun studied by Caganato plant and animal remains were found alongside serving vessels and ritual paraphernalia (such as whistles and drums). Cagnato interprets the evidence from the Chultun as the remains of a feast event held for a large number of people from across the social classes. An interesting aspect of the excavation is the high diversity of the plant remains found (13 different plant families have been identified), which suggests that the range of foods and drinks consumed by the ancient Maya during feasts may have varied more than was previously appreciated.